Biking is loved by millions around the world, but the number of road accidents involving cyclists is unfortunately high as well. Now, thanks to the revolutionary rear-view mirror for racing bikes, mountain bikes and street bikes, riding with the family or friends is both safer and more fun. 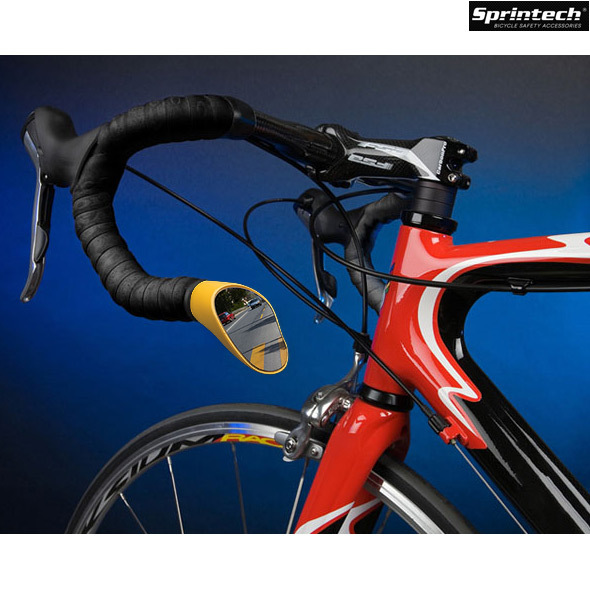 A prize winner at the Competition for Innovation in 1996 in Martigny, Switzerland and Gold Medal winner in Brussels in 2012 Sprintech and Citytech are the indispensable accessories for cycling safety. Unfortunately these mirrors would not fit a Brompton folding bike. These are designed for drop handlebars which are a larger diameter than standard bars and those found on a Brompton. So the mirrors would not actually fit within the handlebars I'm afraid.